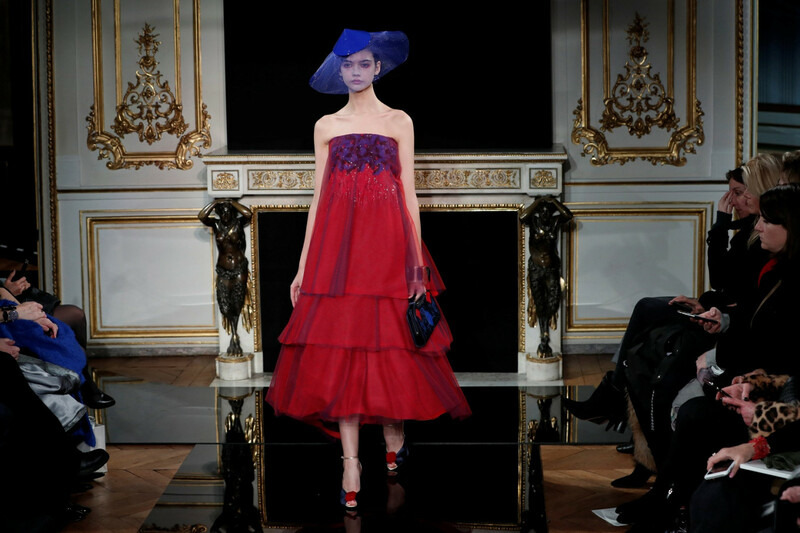 Italy's Giorgio Armani played off bright reds against dazzling blue tones in his Haute Couture fashion collection in Paris on Tuesday, in an Art Deco-inspired feast of feathers, sequins, patent leather and crystals. The designer's gowns have long been red carpet favourites, and the catwalk show drew Hollywood actresses Uma Thurman and Dakota Fanning to the front row, along with Canadian singer Celine Dion. Clunky earrings and patterned gowns recalled the geometry of Art Deco architecture, and models walked to the sultry soundtrack of Bernardo Bertolucci's 1970 film The Conformist. Some outfits in the label's high-end Armani Prive range had an oriental air, in the rounded necklines of some dresses, flowing silk styles, or a kimono-style cloak.